Allows Large Capacity(250GB), Hi-Speed(Over 30MB/Sec. Sustained Read) Removable Storage. This kit includes one FireDock(R) docking bay with FireWire/IEEE1394 to UDMA IDE interface module and one drive tray plus mounting screws. The interface module includes two 400Mbps FireWire/IEEE1394 ports and works as a stand alone repeater at the HDD/Lock key off. The interface module includes RATOC's original circuit and firmware for high-performance FireWire/IEEE1394 to IDE conversion. It supports UDMA mode 4 and achieves over 30MB/Sec. sustained HDD Read Speed. The docking bay includes Hi-reliability 96P DIN connector, low-noise(25db-A) low power(12V/50mA) cooling fan(Air Flow 5.19CFM), and LED indicators for Power and HDD access status. The HDD tray includes 80-conductors ATA133/100 cable and convenient pull-out handle. Support Maxtor 250GB and 'Big Drive'/48bit LBA. Just fits to any PC tower case, external subsystem case and RAID case. Plug and Play, recognized and mounted by the OS automatically. Hot-Swappable, exchange HDD without System shutdown and restart. No Need for ID setting or terminators. Allows booting up with FireWire embedded PowerMac(G4/AGP or better). -Windows 98SE(IEEE1394 Storage Driver update required). Interface Upstream FireWire/IEEE1394 400Mbps two 6P ports. *Use each HDD Power cable on each FR-MDK1 to daisy chain the hard drive. Physical Dimensions 8.4 x 5.8 x 1.5 inches(D/W/H). 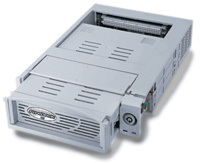 Fits 5" half-height bay of any PC tower case, external subsystem case and RAID system case.